"Surely the grandsons of boys now in school will rejoice to live beside this quiet protected area." This plan is not "north-up" but is "facing the Woods," i.e., looking eastward up the hill from the existing campus, which is at the bottom. North is to the left. Eliot Hall, the Theater Arts Building, and Clay Science Center are at the bottom. Everything to the east of (up from) these buildings is in the Estabrook Woods. Bateman's Pond is off the map a short ways to the right. The map is a total of 1,900 feet, top to bottom margins, and 1,100 feet, left to right margins. Also for scale...the soccer fields are about 350 feet long. And the dark gray bridge is 300 feet long and 23 feet wide. CRIMSON at the top shows land owned by Harvard as part of its ecology study area, the "Concord Field Station." GREEN shows two plastic-grass soccer fields. (Their elevation is 260', which is 70' higher than the deck of the proposed bridge.) And eight tennis courts (stacked at elev. 227' & 235', respectively). 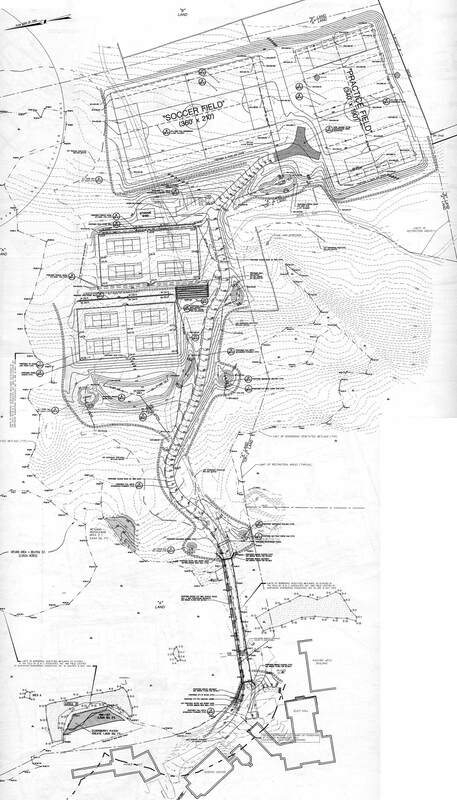 GRAY shows the 20-foot paved road climbing the slope, at up to 6-7% grade. YELLOW shows the existing cart path (to be destroyed; shown for orientation only). BLUE shows stormwater detention basins and structures. 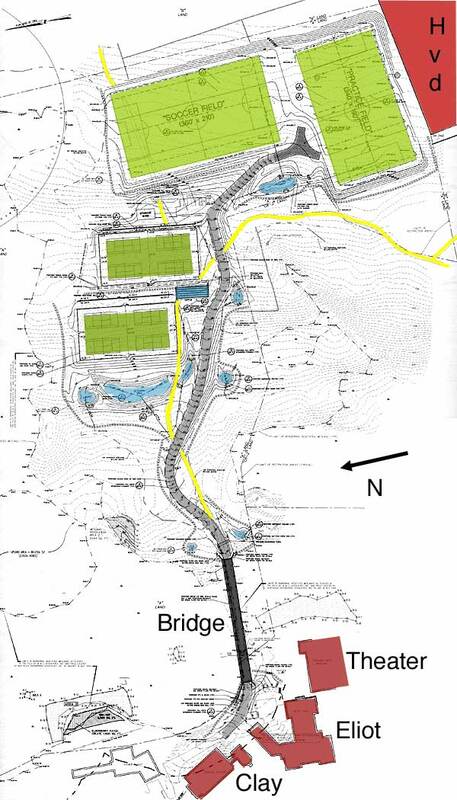 DARK GRAY shows 300-foot x 23-foot bridge (elev. 191') of steel-grate-deck construction, with a 100-foot graded ramp at each end. (Existing causeway is elev. 187'.) BRICK at the bottom shows existing buildings on Middlesex campus. Everything to the east (up) of the Theater Arts building is in the Estabrook Woods. Contours are 1-foot separation. To stack the courts and fields on the slope will require moving and grading 70,000 tons of rock and soil. The Estabrook Woods Alliance seeks to preserve the integrity of the Estabrook Woods as an educational, ecological, and historical resource for Middlesex School and the State of Massachusetts.